One need not surf far on the internet in the realm of social media to find stories dealing with things such as extortion, quid pro quo, favoritism, bias, corruption, due process, abuse of power, collusion, threat, fraud, perjury, abuse of process, and cronyism. While you would think these subjects are discussed frequently in groups associated with politics and public figures, they often pop up in the accounts of folks engaged with Family Courts and ordeals having to do with Divorce and Child Custody. Many lawyers and judges within this industry often dismiss and brush off those mothers and fathers who call out wrongdoings with the court and its players as being disgruntled or resentful. Perhaps that is the case with many, but who can blame most of them for being that way? 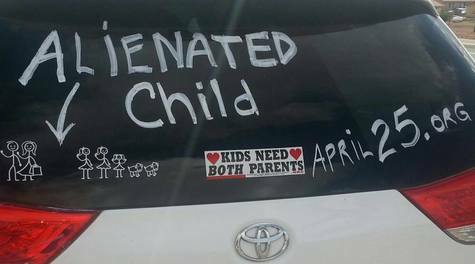 Given the archaic laws and obstacles that unjustly wrong many good parents and children it is no wonder that a parent would feel this way. 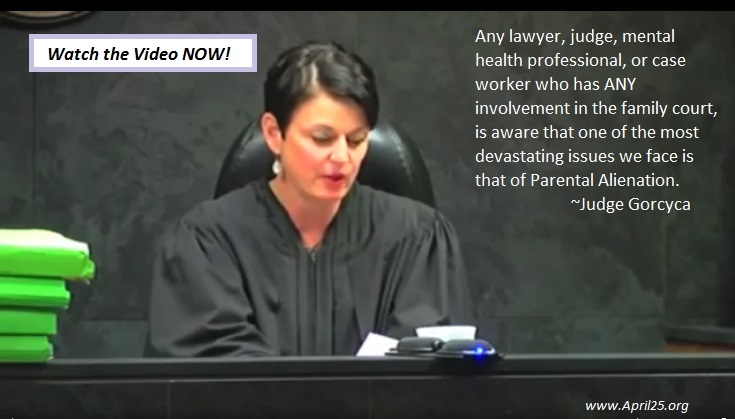 No shortage exists as to the many experiences expressed by these parents, most of whom articulate them in a clear and concise manner, providing evidence that certainly meets the burden of proof in exposing breakdowns in law, due process, ethics and judicial discretion. 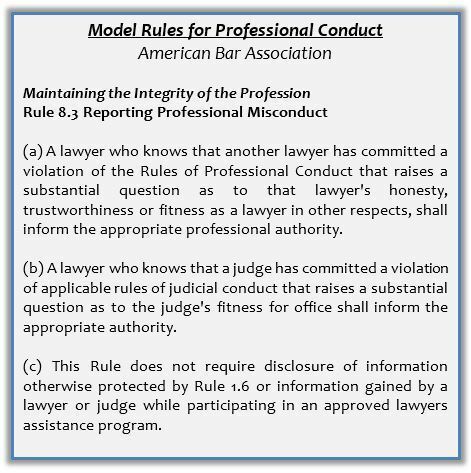 In print, and in theory, it looks pretty decent and honorable when reading the American Bar Association’s model rules for professional conduct where it is stated in rule 8.3 as to the duties of reporting professional misconduct in the industry. The rule speaks to a lawyer who knows another lawyer is in violation of these rules, in terms of honesty and trustworthiness, being obligated to report that lawyer to the appropriate professional authority. Likewise when violations are known by an attorney in regards to judges committing misconduct the obligation exists where the lawyer should report this to the appropriate authority. While the model rules for professional conduct seem pretty straight forward and structured to deter unethical behavior in the courts among both judges and lawyers, in practice it is a remarkable failure. The rules serve only to act as mere “window dressing” in most situations dealing with matrimonial and child custody cases. Very rarely, if ever, does one hear of an attorney in this area of law reporting a judge or lawyer to any oversight or “appropriate professional authority” because doing so could be adverse to that persons livelihood and also may be hypocritical of many to report such instances as they may also engage in the same behaviors on occasion. Many of the courts regularly appearing lawyers who practice in and out of the same courtrooms will almost never report such behaviors as they have to practice in front of the same judges and the same opposing lawyers on multiple occasions. This creates situations where attorneys who may want to do the right thing by reporting such violations are put in a place where they are forced to weigh the possible retaliation by judges and players that could adversely affect them and future clients. The other concerns for them are the forms of blackballing by peers that sometimes goes on against those lawyers blowing the whistle within this industry. The hurdles to address areas of misconduct are many times insurmountable, especially to parents, due to many of the entities designed to investigate having been proven to be ineffective and shielded by a cumbersome process and system of procedures that filter out many legitimate problems and cases of wrongdoing brought to the attention of such groups. Not to mention, most of these groups in many cases do not have the authority to initiate investigations. 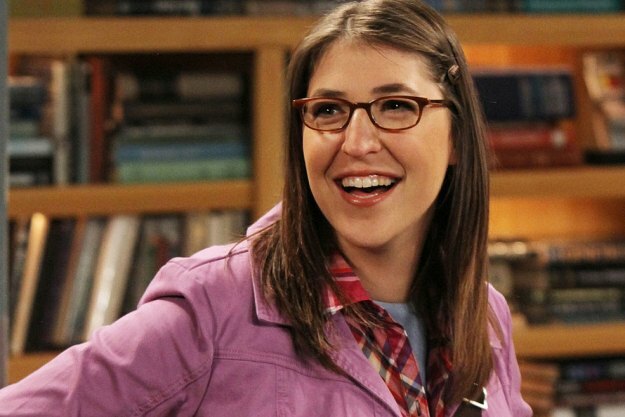 But let’s be clear, many such groups are made up of the peers of folks within the same professional community as those that are reported to them for violations of misconduct. Thus when these oversight committees are cut from the same cloth, in the same geographic regions many times, the odds are stacked against folks who bring legitimate complaints. The expectation for accountability for any wrongdoings and professional misconduct by judges, lawyers and other players in the industry is handed another easy out by means of a discouraging process in place. Many states have had outside and independent assessments done as to examine efforts and report findings of systems set up to dissuade corruption. The reported findings in many states are quite troubling and disappointing. The Center for Public Integrity issues reports speaking to this point and informing the public of its findings. 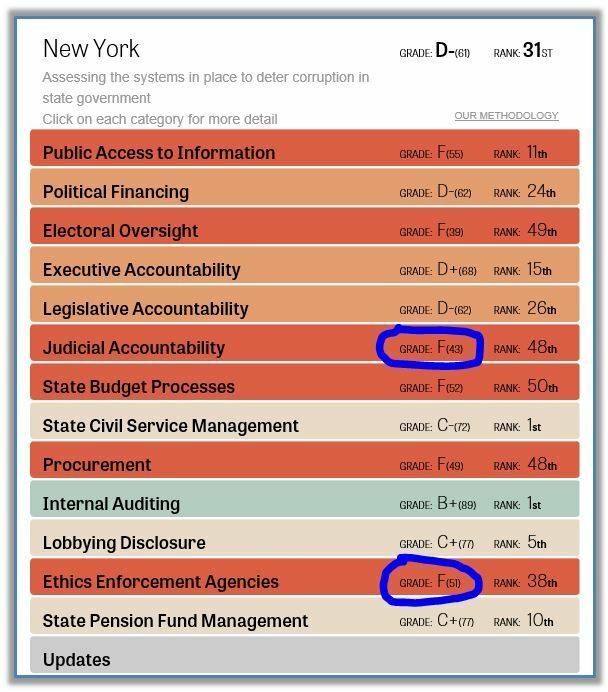 In 2015 the State of New York’s “Judicial Accountability” and “Ethics Enforcement Agencies” both received the failing grade of an “F”. Such findings offer little solace to any person, within the industry or outside of it, who would venture to report violations of professional or judicial misconduct on the part of lawyers and/or judges. ​The current structure of these ordeals in the courts along with the tools of the trade favor protections put in place to shield the wrongdoings and ethical abuses of judges and lawyers on many levels. Ultimately this creates a system where abuses of power and authority prosper at the expense of parents and children while sustaining an industry where profits seem to come before people. All Politics is Local: Is Corruption That Way as Well?